Angled vs Straight Finish Nailers: Which is Best for Your Needs? If you’re in the market for a new finish nailer, then you’ve probably faced a decision between a straight and an angled finish nailer. While they generally serve the same purpose, the differences between the models can change the situations in which they work best. So, we’ve prepared a comparison of the two types of nailer, so that you can choose the one that works best for you. If you’re working in tight spaces, you should check out the angled finish nailer. It still drives nails straight into the wood at the same angle as a straight finish nailer. The “angle” in its name instead refers to the magazine. Instead of running down from the part of the nailer that fires the nail into the wood at a 90-degree angle, it angles back towards your hand, which makes it shorter and more versatile. Finish nailers can come with a variety of angles; typically, somewhere between 21 and 34 degrees, depending on the model. The different angles mean that you must get the right kind of nails for your nailer since the shape of the magazine requires a different nail configuration to work properly. Angled finish nailers typically use thicker nails, which are more expensive and harder to find. However, they can support more weight. 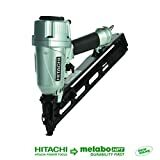 While those thicker nails might be unsightly compared to those on a straight finish nailer, the angled finish nailer is designed for use in tight spaces, which generally aren’t places that people can see. Overall, the angled finish nailer uses bigger nails and is appropriate for larger tasks, but where it excels is in its ability to fit into tight spaces. While its nails are a bit more expensive and harder to find, they make up for it in increased holding power. Straight finish nailers feature a magazine that is a 90-degree angle relative to the tool. This means that they sometimes have a larger magazine than a comparable angled model, but this is something that varies from model-to-model. Because they aren’t angled, they don’t work as well in tight spaces. However, they do use a smaller nail, which has a smaller head and is going to be less noticeable. And since the nail is smaller and comes at a standard angle, it is generally much easier to find them at your local stores. They also tend to be somewhat cheaper. Sealed lube dual tech: motor works as an oil free and oil lube unit. One of the biggest upsides to the straight finish nailer is that they tend to be significantly cheaper to buy than angled nailers. Given the lower starting price and the lower cost of nails, you’re looking at a much lower cost of operation over the lifetime of the tool. If you don’t need to nail in tight spaces, you can save a lot of money and miss out on almost nothing by purchasing a straight finish nailer. Overall, straight finish nailers are best for people who are cost-conscious and make for an especially good buy if you’re not going to need to work in tight spaces. Angled finish nailers are generally more versatile than straight nailers, and since they also use thicker nails that can hold more weight, are the better buy in most circumstances. However, if you’re not going to be working in a lot of tight spaces, you lose a lot of the value from an angled finish nailer. 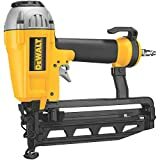 So, if you’re looking for a cheaper upfront cost, lower cost of operation and don’t need to work in tight spaces, then the straight nailer will be a good choice. Framing Nailers vs. Finish Nailers: What’s the Difference?